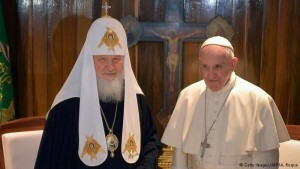 Patriarch Kirill and Pope Francisl have signed a joint declaration on religious unity after their historic meeting in Havana Friday. 3. 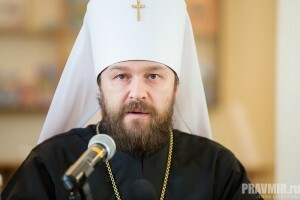 By meeting far from the longstanding disputes of the “Old World”, we experience with a particular sense of urgency the need for the shared labour of Catholics and Orthodox, who are called, with gentleness and respect, to give an explanation to the world of the hope in us (cf. 1 Pet3:15). 12. We bow before the martyrdom of those who, at the cost of their own lives, have given witness to the truth of the Gospel, preferring death to the denial of Christ. We believe that these martyrs of our times, who belong to various Churches but who are united by their shared suffering, are a pledge of the unity of Christians. It is to you who suffer for Christ’s sake that the word of the Apostle is directed: “Beloved … rejoice to the extent that you share in the sufferings of Christ, so that when his glory is revealed you may also rejoice exultantly” (1 Pet4:12–13). 13. 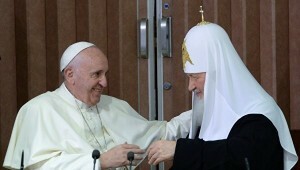 Interreligious dialogue is indispensable in our disturbing times. Differences in the understanding of religious truths must not impede people of different faiths to live in peace and harmony. In our current context, religious leaders have the particular responsibility to educate their faithful in a spirit which is respectful of the convictions of those belonging to other religious traditions. Attempts to justify criminal acts with religious slogans are altogether unacceptable. No crime may be committed in God’s name, “since God is not the God of disorder but of peace” (1 Cor14:33). 18. The Christian churches are called to defend the demands of justice, the respect for peoples’ traditions, and an authentic solidarity towards all those who suffer. We Christians cannot forget that “God chose the foolish of the world to shame the wise, and God chose the lowly and despised of the world, those who count for nothing, to reduce to nothing those who are something, that no human being might boast before God” (1 Cor1:27–29). 21. We call on all to respect the inalienable right to life. Millions are denied the very right to be born into the world. The blood of the unborn cries out to God (cf. Gen 4:10). The emergence of so-called euthanasia leads elderly people and the disabled begin to feel that they are a burden on their families and on society in general. We are also concerned about the development of biomedical reproduction technology, as the manipulation of human life represents an attack on the foundations of human existence, created in the image of God. We believe that it is our duty to recall the immutability of Christian moral principles, based on respect for the dignity of the individual called into being according to the Creator’s plan. 22. Today, in a particular way, we address young Christians. You, young people, have the task of not hiding your talent in the ground (cf. Mt 25:25), but of using all the abilities God has given you to confirm Christ’s truth in the world, incarnating in your own lives the evangelical commandments of the love of God and of one’s neighbour. Do not be afraid of going against the current, defending God’s truth, to which contemporary secular norms are often far from conforming. 23. God loves each of you and expects you to be His disciples and apostles. Be the light of the world so that those around you may see your good deeds and glorify your heavenly Father (cf. Mt 5:14, 16). Raise your children in the Christian faith, transmitting to them the pearl of great price that is the faith (cf.Mt 13:46) you have received from your parents and forbears. Remember that “you have been purchased at a great price” (1 Cor 6:20), at the cost of the death on the cross of the Man–God Jesus Christ. 24. 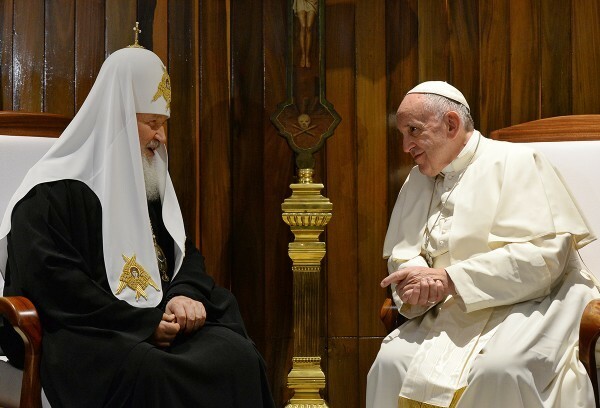 Orthodox and Catholics are united not only by the shared Tradition of the Church of the first millennium, but also by the mission to preach the Gospel of Christ in the world today. This mission entails mutual respect for members of the Christian communities and excludes any form of proselytism. We are not competitors but brothers, and this concept must guide all our mutual actions as well as those directed to the outside world. We urge Catholics and Orthodox in all countries to learn to live together in peace and love, and to be “in harmony with one another” (Rm 15:5). Consequently, it cannot be accepted that disloyal means be used to incite believers to pass from one Church to another, denying them their religious freedom and their traditions. We are called upon to put into practice the precept of the apostle Paul: “Thus I aspire to proclaim the gospel not where Christ has already been named, so that I do not build on another’s foundation” (Rm 15:20).